Creating a niche of Air Dryers such as Gas Drying Systems, Low Pressure Air Dryers, Refrigerated Air Dryers, Industrial Air Dryers, Carbon Di Oxide Dryers, Gas Dryers and many more items at its best, with utmost quality. Understanding the demands of customers as a manufacturer and exporter, we are engrossed in providing Heatless Air Dryers. Demanded in hospitals, clinics and private nursing homes, these dryers are developed keeping in mind the variegated demands of customers. Apart from this, these dryers are checked rigorously to ensure flawlessness. We manufacture and export an extensive range of heatless type air dryers, which is a simplest form of desiccant type gas or air dryer. These are used to achieve a dew point of -40 deg c or excellent for compressed air systems and other gas and air dryer applications. There is no increase in the effluent gas temperature and the desiccant beds remove oil in its vapor form. Heatless type air dryers, which is a simplest form of desiccant type gas or air dryer. These are use to achieving a dew point of -40 deg c or excellent for compressed air systems and other gas and air dryer applications. There is no increase in the effluent gas temperature and the desiccant beds remove oil in its vapor form. Air Capacity 10 CFM to 500 CFM dew point up to (-) 80 deg c Heat of Compression Air Dryer we are amongst the reliable heat of compression type dryer's manufacturers. Our heat of compression dryers have a very low maintenance cost as there is no moving part. There is no loss of compressed air in our dryers and are also skid mounted and can be easily installed. the heat of compression dryer (hoc) is fully automatic with pneumatically actuated ball / plug valves. A sequence timer controls operation of these valves. Desiccant used is activated alumina and it dries the air up to (-) 40 deg c dew point. We offer optimal quality Industrial Air Dryers which are highly efficient and accurate. Our internally heated air dryers are made up of the best quality equipments and parts. We provide our heated air dryers at competitive prices and also well within the stipulated time. We are one of the authentic heated hot air dryers exporters from india. 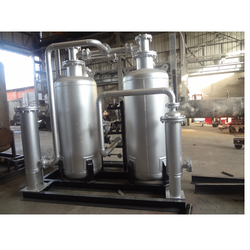 Instrument air dryers for power plants Refineries & Petrochemicals, chemical & fertilizer plants etc. CNG Compressed Natural Gas drying & conditioning plants, Gas Dryers. 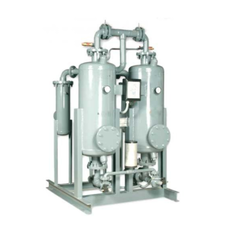 Hydrogen Gas Drier for generator Cooling Application. With our profound vision, we have brought forward Low Pressure Air Dryers for our prospects. Used specifically for polyester industries wherein, huge quantity of air is required to be dried at a very low pressure. These dryers are considered to be an effective solution for refrigerated air drying applications and can be purchased at market leading prices. We have fabricated these dryers as per the set industry norms and ensure our customers trouble-free operations. We are the leading manufacturer and exporter of huge quality range of Refrigerated Air Dryers to our premium clients. Our product range are known for their high performance and durability, these products are manufactured by using quality raw material. The basic principle is the removal of moisture by cooling air to certain present temperature. The concept of efficient cooling is removal of heat only. The air first enters into the pre-cooler where the incoming hot air is being cooled by outgoing cold air so as to reduce the heat load of evaporator . The air from pre-cooler enter into the evaporator where further heat is removed by boiling refrigerant like freon. now the air get condensed and this moist air is passed through a moisture separator where moisture is drained out by centrifugal action of air. The moist free air enters into pre-cooler to cool the incoming air. 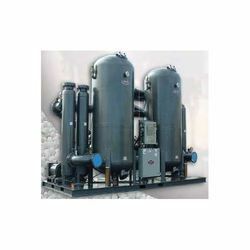 These Compressed Air Dryers are designed for continuous and trouble free operation. The range has sufficient versatility to meet the large scale of industrial needs. The copper corrosion free tube in tube type heat exchanger performs as a evaporator as well as pre-cooler, the well balanced design maintains fluid velocities through tubes and promotes maximum heat transfer and minimum pressure drop. The heat of compression (HOC) dryers is the latest generation chemical dryers based on adsorption principle. It does not have complex valvings & is eliminated with purge loss drawback as in heatless type dryer. HOC offers best atmospheric dew point i.e. -70°C. It's having least running cost with best quality of air. Have lesser pay back period. It is a stationary system, fully automatic, continuous duty with long efficient service life. This dryer is most users friendly. Application: Mass quantity instrument, process air in chemical industries & other engineering applications where mass volume air may be required. Operating Pressure: 7 Kg/cm2 standard Design Standard: ASME SECT VIII DIV I, TEMA, IS Standard. Location: After air receiver, in comp. air system.